THE BEST IMPRESSION WITH ROJ. Our attentive staffs will professionally guide you through all the steps to create the best signage and advertising communication tools for your business. Our complete signage solution program includes design and consult, construction and materials planning, in-house production, installation, sign and construction approval, maintenance, and Signcare service. 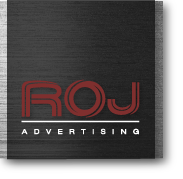 © 2016 Roj Advertising. All rights reserved.